Involute spline rotary broach shapes are popular forms used for connecting driven components in machines and vehicles. Typical examples would include gear shifters on motorcycles and clamps for engine shafts. Standard splines and involute splines control power transmission by the way contact is designed into the teeth. Involute Spline rotary broach tools can be made to international standards or custom made to your specifications. However, most are made to the customer’s specified dimensions. Polygon Solutions does stock standard size involute spline rotary broaches. Standard involute spline sizes are listed below. 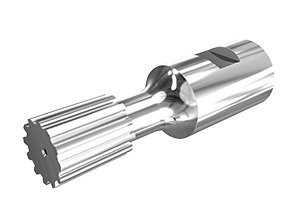 The size of involute spline forms that can be made by rotary broaching is limited by the amount of material to be removed. Please email us a print to determine if rotary broaching is feasible for your application. Oversize pilot holes are required for all involute spline form rotary broaching applications. The pilot hole will leave a small radius at the inside corners. This radius is often acceptable because contact is still made at the outside of the form. To request a quote on a Involute Spline Rotary Broach fill out our online quote form or call us at 239-628-4800. 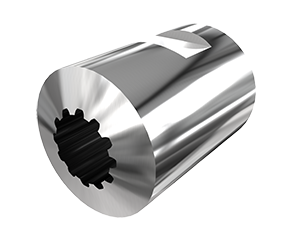 Polygon Solutions offers a wide range of Standard Internal and External Involute Spine Rotary Broaches that are designed to be used individually or as mating parts. All sizes conform to the ANSI B92.1 Standard and are available for fast delivery. These Internal Involute Spline Rotary Broaches can be used with our 1/2″ Series GT Rotary Broach Tool Holder. These External Involute Spline Rotary Broaches can be used with our External Series GT Rotary Broach Tool Holder.